Branson, Missouri has earned a name for itself as one of the live entertainment capitals of the USA. Between the family-friendly fun of its many amusement parks and natural wonders, and the shopping and live entertainment, an entire family can find its favorite activities here. At the Branson Nantucket, you can even enjoy the best of both Branson fun and Cape Cod-style timeshare luxury at the very center of it all. The resort has an on-site swimming pool and several amenities within quick driving distance of the site. Your concierge service will be able to point you in the right direction for wherever you want to go, whether it’s the best places to take the kids or a romantic candlelight dinner and show. These Branson timeshares for sale offer you luxurious accommodations in an Eastern-seaboard style setting right down to the coastal architecture and clubhouse. 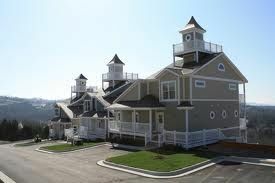 Vacation ownership at the Branson Nantucket feels more like condo ownership than a standard vacation unit. With one of the Branson timeshares for sale, your Cape-Cod style residence will welcome you with a fully equipped kitchen, up to 4.5 bathrooms, and a comfortable resting place after a full day on the town. You can pick the size of the rooms that you will need. On the smaller end, one and two bedroom residences sleep between four and six guests. Larger two bedroom, three, four and five bedroom vacation homes sleep upwards of eight to fourteen people without feeling like you’re crowded. The Branson Nantucket resort puts you at the very heart of Branson. The town's famous live entertainment and amusement parks can suit different ages. The Silver Dollar City is perhaps the most famous, letting you enjoy the myriad of rides, live shows, attractions and fair foods. Plus, you can go go-karting, mini golfing, and shopping all within an easy distance of the resort. For the outdoor lover, Branson Nantucket means entire summer days spent outside on the shores of Table Rock Lake. The resort overlooks the lake, which has 720 miles of shoreline for boating, swimming and fishing. Outdoor enthusiasts can also go golfing, tour the wineries, and generally get out and enjoy this beautiful corner of America. Contact Branson Nantucket Specialist Today! We really enjoy our timeshare in Branson because Branson has so much to offer and there is an endless number of activities in the area which are compatible to all ages. It is near Silver Dollar City which is great all summer but in addition to that their Christmas extravaganza is out of this world. There are many shows to see in Branson with performances both in the afternoon and evening. We have never been disappointed in a show as they contain both comedy and fantastic musical talent. We especially like the Christmas shows along with all the others available. We thinks the restaurants are great. There are different prices so you can make it a lovely dinner or there is fast food, buffets, and just about anything else you would want. If you are a shopper there are many shopping strips available as well and the Tangier Outlet Mall which is a favorite of ours. If crafts are your thing they have several craft malls available. As for the lodge itself it is conveniently located in a lovely area. The rooms are spacious, clean and very accessible. The staff are always available for any questions you might have and if you have any questions they will find the answer for you.